In the tradition of A Walk to Remember, this is a story of a teenage girl and her first encounter with heartbreak and love. Seventeen year old Veronica "Ronnie" Miller's life was turned upside down when her parents divorced and her father moved from New York City to Wilmington, North Carolina. Three years later, she remains angry and alienated from her parents, especially her father...until her mother decides it would be in everyone's best interest if she spent the summer in Wilmington with him. Ronnie's father, a former concert pianist and teacher, is living a quiet life in the beach town, immersed in creating a work of art that will become the centerpiece of a local church. The tale that unfolds is an unforgettable story of love on many levels first love, love between parents and children that demonstrates, as only a Nicholas Sparks novel can, the many ways that love can break our hearts...and heal them. My Review: I listened to The Last Song by Nicholas Sparks on my ipod and thought it was so good. I really, really liked this book. I like all his books, but I think this is one of his better ones. I rank this right behind The Notebook, which is on my top 10 list. It was a wonderful book that was both heartwarming and heart breaking. I loved the characters and all the twists in the book. 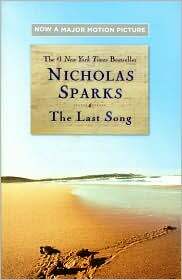 Nicholas Sparks brought me right into their lives. The story was “fun” to follow. I couldn’t get enough of the love story between Ronnie and Will, the friendship between Ronnie and Blaze, the relationship between Ronnie and her father the birthing of the sea turtles, and the bond between Ronnie and Jonah. Make sure you have some tissue – you will need it. I believe if I had read this book, I would not have been able to put it down. Definitely, recommend this one. The Movie: Last weekend I went out and bought the movie. I loved the movie as well. The actors were perfect and I thought it followed along the story line well enough. There were differences, but it close to the same. I tend to be a person that likes the book over movie, but in the case, I have to say it was a tie! This is a tear jerker – so you have been warned! Rent it or buy today or when you need a good cry! I loved this book and teared up near the end. It brought back memories of first loves, rivals, friendships and more. Free quality ringtones for people around the world. Leave your comment to me for more development on ringtones.